Our digestive system is home to trillions of bacteria which battle for our health. Sometimes they help us digest food and something they battle harmful microbes. When we take antibiotics to combat bacterial infections, beneficial bacteria can also be killed off, leaving us at risk of infection by harmful bacteria. Clostridium difficile is one of those harmful bacteria and is the leading cause of hospital infections in England and Wales and in hospitals all over the developed world. As C. difficile becomes more resistant to antibiotics, it becomes harder to treat, so new ways of controlling C. difficile infections are needed. Bacteriophages are naturally occurring viruses that target bacteria. That's not a new not a new idea, it was in development shortly after their discovery at the start of the 20th century. However, after the discovery of penicillin and other antibiotics the research into the use of phages was abandoned in the West. 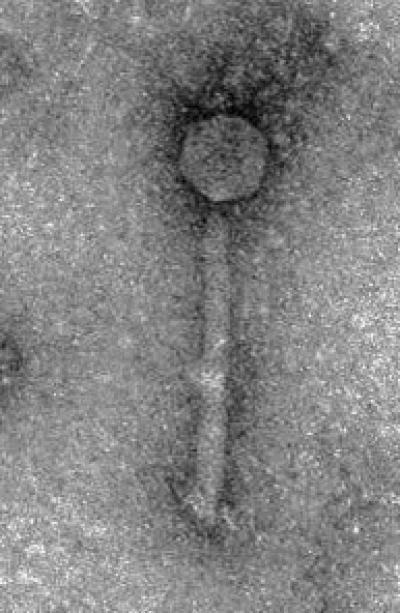 Application did continue in Eastern Europe, particularly in Georgia, and now that bacterial resistance to antibiotics is becoming a large problem, there is renewed interest in developing bacteriophage therapy. For use as a therapy, the bacteriophage must not affect any of the hundreds of different bacterial species that make up a healthy human microbiota. Researchers at the Institute of Food Research in the UK had previously discovered and isolated a bacteriophage that specifically targets C. difficile. A new study looked to assess how effective using this phage might be in combating C. difficile infections. The researchers used a model of the human colon, set up to mimic that of an elderly person in hospital. Antibiotics were given in the same way as in hospital, disrupting the normal balance of bacteria and allowing C. difficile to establish itself, and then produce the toxins that make C. difficile infections so dangerous. The study showed that the administration of a specific bacteriophage significantly reduced the number of C. difficile cells and also the amount of toxin produced, without significantly affecting the other members of the gut microbiota. This suggests that bacteriophages could have great potential for use to combat C. difficile infections in hospital settings. The phage wasn't, however, able to kill off all of the C. difficile cells. This was because this bacteriophage, like many others, is able to insert its own DNA into the bacterial chromosome – a process known as lysogeny. This makes the bacteria resistant to further bacteriophage attack. Interestingly, in some cases the lysogeny seemed to prevent the C difficile cells from producing the toxin. So although all of the cells aren't killed, those that survive are a lot less dangerous. This may give clinicians more time to get C. difficile infections under control. This bacteriophage shows considerable promise as a new therapeutic agent to control C. difficile infections in hospitals, with potential to provide a new weapon that is desperately needed in the battle against superbugs.